Characters in Flight balloon at sunset in Downtown Disney, Walt Disney World, Orlando, Florida. Nikon D700/28-300VR, 1/60s, f/5.6, ISO 500, EV +1.0, 122mm focal length. Someday I am going to enjoy the Characters in Flight attraction at Downtown Disney. For now, I will have to settle with photographing this unique hot air balloon as it floated in a pastel sky minutes before the Sun went below the horizon. 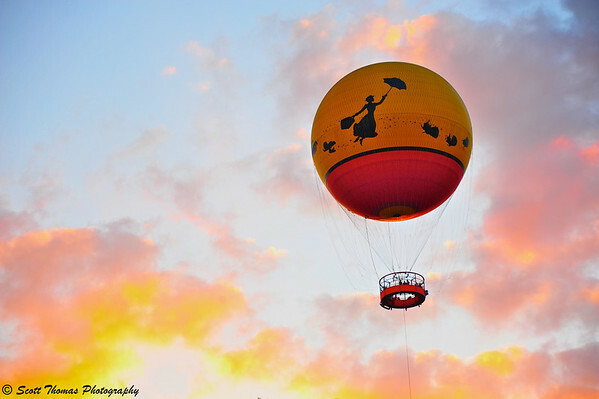 This entry was posted in Photography, Travel and tagged 28-300mm, characters in flight, clouds, downtown disney, florida, hot air balloon, nikon D700, orlando, sky, sunset, vr, walt disney world. Bookmark the permalink. Tracy, I have not had a lot of luck at Walt Disney World when it comes to sunsets. This was the best I have been able to capture. It was a little too windy for my tastes this day. It moves quite a bit up there. On another note, did you notice the flickr photo I uploaded today? Fabulous mood and shades in the Disney sky ! Love those characters in flight. Thanks, Isa! This attraction was copied from the original one in Disneyland Paris. Your timing was perfect for that one! Nice shot! I had been watching the sky but couldn’t figure out how to capture it. There’s too many buildings in this area for a landscape and then I looked further up to the balloon. Oh my. You got me with a pun. You should be ashamed, but I know you’re not. Well, I’m going to have to say it: Up, up and away!!!!! The light on the ballon is fantastic. LOL Thanks, Barb. I added a video link to that song on this photo’s flickr page. Great shot, Scott. I really wanted to seek out a hot air baloon festival this summer but never got around to finding one. That’s one thing I really want to photograph. We have one here in Syracuse each June. You are more than welcome to come down for a visit. Wow, now that’s a great image; love it! Well, this balloon is tethered (you can see the tether underneath the balloon) and can only go up and down and side to side as I witnessed. However, on most mornings around Orlando, you can see other un-tethered hot air balloons in the sky. They sure do! Love it when things come together like this. Fantastic shot! Mary Poppins is one of my favorite characters. She’s perfectly perfect on that balloon with the sunset highlighting the clouds. She’s one of my favorites, too. Wow the balloon compliments the clouds perfectly! Nice shot!